is a favourite family tradition that has become a Toronto institution. Since 2003, The Goodtimes have entertained audiences with their own unique blend of irreverent hilarity and heartfelt fun to create a brand new type of vaudevillian variety show …of the old timey persuasion. Ian and Lindsay Goodtimes are the married couple dynamic-duo behind the show. Also featured (more and more as they grow up) are their two young daughters, Roxy-Jean and Pepper. 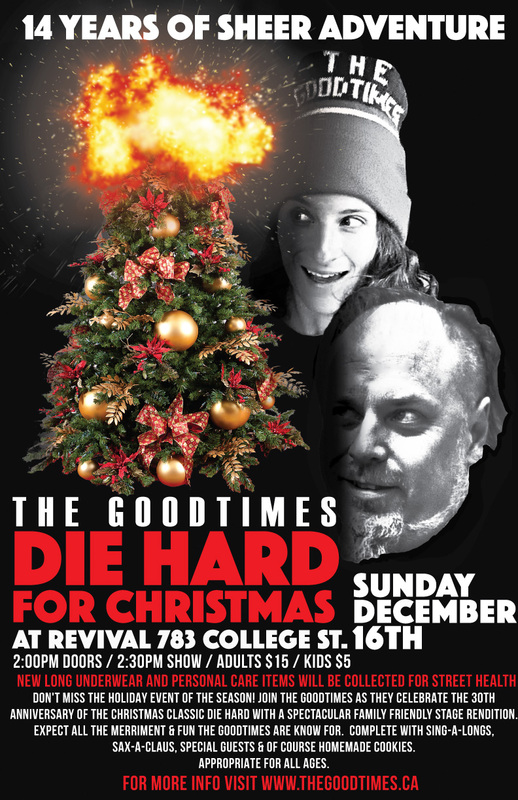 The Goodtimes bring together a holiday army of Toronto’s best dancers and musician – plus favorites such as audience sing-a-longs, dance mobs, Larry the Bear, Sax -a- Claus and Swansea School of Dance Company all join in the fun and, let’s not forget, homemade cookies for all!